How to Log in to your Silvertrac Account or Retrieve a Forgotten Password. In this article we will go over how to log into the Silvertrac portal and what to do if you forget your password. NOTE: Make sure that you are using your company's unique URL (web address). Do not use the "www." prefix before the URL address. For example: testsite.silvertracker.net is all that is needed in your web browser. To login, click the blue Login button in the top-right corner of your screen. In the gray Login box, enter your unique User Name and Password. NOTE: The User Name and Password are case sensitive. If you forgot your Password you can enter your User Name in the Forgot Your Password? box below and click Submit. Your Password will be emailed to the email address associated with your User Name account. 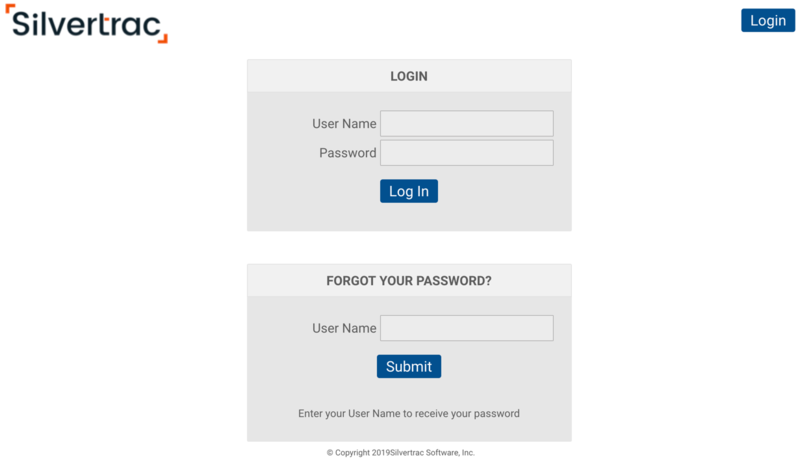 If you have further questions about logging into your Silvertrac portal please contact your Customer Success Manager or Tech Support at support@silbvertracsoftware.com or 888-505-8722 ext 4.